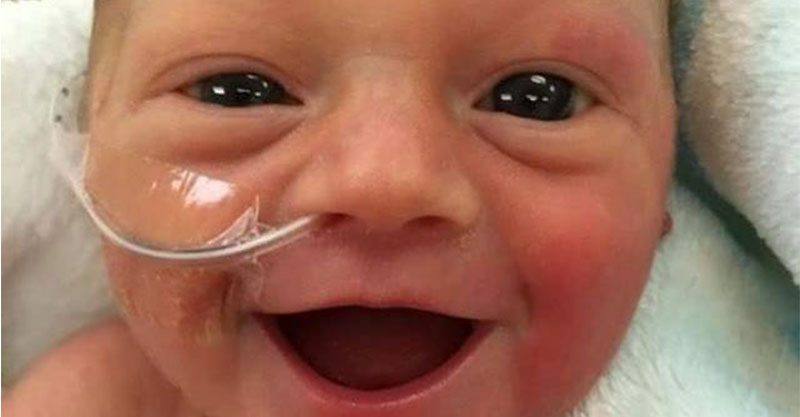 A grateful mum has shared a smiley image of her baby girl, born at 34 weeks gestation against tough odds, and the internet is going a little bit nuts for it. While life can be touch and go for early babies, teeny Freya certainly seems to know exactly how lucky and loved she is, delighting her parents (and the entire internet) with a huge grin. “Our first daughter at five days old. 3 lbs. 14 oz., she was happy to be alive! This picture was one I looked at often to get me through the ups and downs of our NICU days. Life is so precious,” Freya’s mum, Lauren Vinje posted. She shared the smiley image of her five-day-old daughter alongside her birth story and it’s not as peachy as you might think. It’s a story of tragedy thankfully averted and a pretty amazing example of things turning out for the best, despite all signs pointing to potential disaster. Mum-to-be Lauren developed pre-eclampsia at 28 weeks gestation, despite things going absolutely swimmingly up until then. Her eagle-eyed mum spotted the tell-tale signs of swollen ankles and feet, and warned Lauren that something was amiss. Yet, despite other pre-eclampsia symptoms, including elevated blood pressure, protein in her urine and visual disturbances, her doctor dismissed her worries, saying there was no cause for concern. Sadly, her symptoms got progressively worse and despite her doctor’s continuing insistence that everything was fine, it really wasn’t. Thankfully her doctor got some further advice from a colleague and Lauren was admitted to hospital six weeks later as things went rapidly downhill. Freya’s heart rate was not what it should be, and it was decided she needed to be delivered quickly. But despite best endeavours, Lauren wasn’t dilating, time was ticking and baby Freya had flipped upside down. An emergency c-section was now the only option and Freya made her appearance after a two minute procedure, thankfully a-okay. Doctors told Lauren that Freya’s unusually short umbilical cord was wrapped around her neck and if she hadn’t turned, and sparked the c-section decision, a vaginal birth would have had tragic results. “There were so many things I thought were going “wrong” in the moment they were happening. Looking back, it all went perfectly,” Lauren told Birth Without Fear. We can’t help but think Freya agrees! Winners are indeed grinners!